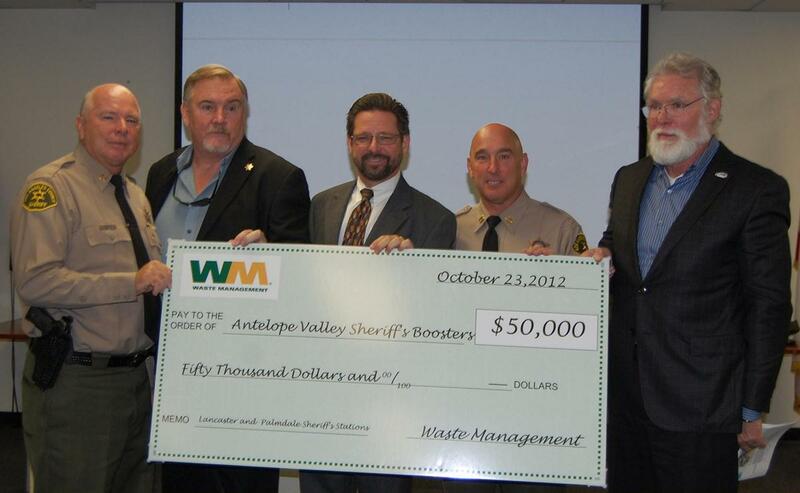 Waste Management of Southern California presented a $50,000 donation to The Antelope Valley Sheriff’s Boosters Tuesday, which will be used to purchase Tasers for the Lancaster and Palmdale Stations. (L to R) Palmdale Station Commander Bobby Denham; A.V. Sheriff’s Boosters President Marvin Crist; Waste Management Director Doug Corcoran; Lancaster Station Commander Bob Jonsen; Mayor R. Rex Parris. LANCASTER – Lancaster has one of the busiest sheriff’s stations in Los Angeles County, yet the station’s use of force rates per 100 arrests are among the lowest, said Commander Bob Jonsen. “That tells us that our deputies are doing their jobs in an extremely professional way, without having to resort to force,” Jonsen said. Lancaster sheriff’s deputies will be able to maintain and improve on this trend, thanks to a large donation from Waste Management of Southern California. The community partner donated $50,000 to the Antelope Valley Sheriff’s Boosters Tuesday, which will be used to purchase “less lethal” weapons for both Lancaster and Palmdale Sheriff’s Stations. “You all keep us safe and the least we can do, we think, is try to do something to help you be safer when you’re out there looking out for us,” said Waste Management Director Doug Corcoran. The funds have been earmarked to purchase about 50 state-of-the-art Tasers, which will be distributed to deputies at both stations, officials said. 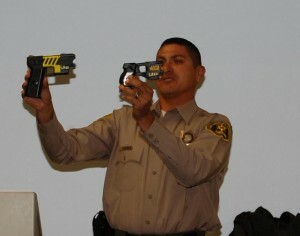 Deputy Miguel Ruiz compares the lighter more sophisticated Taser with the bulky Taser that deputies currently use. Tasers were in short supply at the Lancaster and Palmdale Stations, and the Tasers deputies did have were old, outdated and unreliable, said Jonsen and Denham. The new Tasers will feature a laser sighting system and other improvements that will give deputies more accuracy and convenience in high risk situations, said deputy Miguel Ruiz added. “It’s a lot more convenient as far as size, it’s a lot more convenient as far as more cartridge storage, it’s lighter, and it’s a lot more user-friendly for the deputy,” Ruiz said. The Lancaster Station currently has about 58 Tasers for more than 200 personnel, Jonsen said. Even with the new donation, there are still not enough Tasers to go around. Lancaster Mayor R. Rex Parris vowed to do something about it Tuesday. 21 comments for "$50K donation to fund Tasers for Lancaster, Palmdale Stations"
Yeah, those who don’t understand think that “they need to train cops to be sympathetic and talk the a-hole criminals into compliance”. Most of the general public doesn’t get it. If you even mouth off to a cop, you deserve the taser. I would never mouth off to a cop…I’d be respectful. WM is commended for making the donation to the sheriffs. A big tax write off and publicity are always good. I have to admit though, the Los Angeles Sheriffs aren’t cash poor. Why couldn’t each member of the Palmdale/Lancaster force just donate a percentage of their income. 50K a year as a sheriff doesn’t create much of a need for handouts. Why don’t sheriffs employees donate money to buy tasers to manage people. I mean the starting salary for a sheriffs trainee is 4700-5800 monthly. + add non-sworn employees, civilian wards, etc. and I’m sure they could all donate funds over 3 months to meet their TASER goal + more or to buy a LRAD speaker or something. Falangilism? How further Capitalist Right can we get? What other form of Facisism would you like? Or do you prefer, Lancasters Monarchism? I love it …Waste Management gives money to the Sheriff’s Dept to clean up a different variety of trash (the AV’s trashy citizens). Great to see two agencies helping each other out. If WM had hired an additional unemployed person to their antelope valley operations, imagine the benefits to that mans/womans family. 1 employed person supporting many more and the economy. Only way the AV can get rid of “Trashy citizens” is by creating more jobs and reducing closed/non-producing industries like SECURITY. I would like to see the minimum 4700-5800 monthly salaried sheriffs donate a months worth of salary to help create jobs. Its only 940K to help the AV. I’d like to see people stop waiting for a hand out and bust their rear ends to make their way of life better. Without getting to lengthy and long winded, I think thats a big problem now-a-days. People waiting for a hand out, for a President (one single person), a miracle, ect to make their lives better. Hard work folks, a little elbow grease and determination ! My original post was me just being silly but honestly I dont like seeing people go through hard times…but I hate laziness even more. Did you know there have been 532 documented taser-related deaths in America? I guess its a small number considering how many cities tasers are used in and how many years they have been in use, but they CAN kill you if you are one of the unlucky. I dont have a problem with tasers when used correctly by law enforcement in an appropriate circumstance but unfortunately some cops use a taser as their personal “torture toy” and look for any excuse to use the taser on a suspect and in most cases a suspect will just have to endure 10 to 20 seconds of torture, until enough people die, then perhaps laws will be passed preventing law enforcement from using tasers as a “first resort”. FYI, tasers are not ‘first resort’. Talking to the person is first. I don’t have the breakdown for the use of force levels, but no deputy I know of will whip out their taser unless the situation warrants it (I.E. there is a high risk of assault/personal danger/safety of others), and even then they don’t just taze the person without assessing the situation. And LASD does not refer to any weapon as ‘non-lethal’, they are all known as ‘less-lethal’ or ‘lethal’, simply because even rubber bullets and pepper balls have the potential for killing somebody on accident. Police tasers only relay the charge for 5 seconds. Not 10 to 20 seconds. I used to be like you, thinking that all cops are decent humans and treat all people with respect and professionalism, and some are like that, but many are not. Just spend one month being homeless, or one week in L.A. county jail, or hang around a really bad neighborhood long enough and your eyes will be opened. How many people suggesting what you are suggesting have sat in a radio car and rode along side a deputy and seen what they do and have to encounter. Most have no idea. It’s easy to form an opinion based on media isn’t it. Try getting out there and getting your info first hand. We all watch TV too. @Sammy P, under the new rules of this site, I must respectfully disagree with a few of your points above. One is not “unlucky” when shot with a taser. Luck has nothing to do with it. If you decide to get all tweeked out or smoked out on drugs, then try to fight with police, you might get shot with a taser. That’s your own screw up, not a stroke of “unluckiness.” Of the 532 ‘alleged’ documented taser caused deaths, I’m sure 532 of those people had narcotics in their system, and/or preexisting medical problems. Keeping that in mind, that person should avoid behavior that would cause police to use a taser on them!! It’s real simple. As pointed out above, a taser blast only lasts for 5 seconds, but yes, can be reactivated by each pull of the trigger. However, the tasers of the past several years have internal components which record each activation. Therefore, it could easily be proven/disproved whether or not abuse occurred. I wouldn’t take Youtube as evidence of truth. I’m sure a few abuses have occurred, but compare that to the amount of folks whose behavior was stopped by a taser prior to a firearm being necessary to stop them, and it’s obviously worth it. Bottom line: stop acting like a damn fool, and the police will not “taze you bro”! Oh…one last thing…I try not to “Just spend one month being homeless, or one week in L.A. county jail, or hang around a really bad neighborhood.” That helps me avoid being tased too. I never said tasers were not used in cases where they are truly needed. Of course they are, but I have met some very corrupt LA county sherrifs deputies here in the AV during the 20 years I have lived here, and I know that if you put a taser in their hands its going to be used to torture suspects when they can get away with doing so. And thank you for “respectfully disagreeing” I would hope that people here can be respectful with or without board rules forcing them to be. Go get them bad boys and lets clean up this community! Concerned…apparently you failed to read the (Important message) on the Readers Speak Out! What’s you’re point Quigley? I am just stating a fact. You confused?